Trophy Solutions Africa is situated in Limpopo Province and will collect trophies (seven or more), free of charge in the following provinces / areas of South Africa. Should there be a substantial number of trophies in another province, not mentioned above, TSA will also collect free of charge. Please contact us regarding any collection! Once the client has completed his/her Safari, he/she can arrange with the Hunting Outfitter or Professional Hunter to contact us for collection of the trophies. We will then agree on a date and time to collect trophies. Alternatively, you can inform us before your Safari commences, to arrange a date and time of collection with the Outfitter. The sooner the collection can take place, the sooner the the trophies will arrive back at their new “home”. The cost for collection of Trophies is included in our prices. On collection we go through each and every trophy, together with the Outfitter, Professional Hunter or representative of the company. We ascertain ourselves that all trophies are in good order and that they are properly tagged. We do not accept responsibility for hair slip caused by poor field preparation of trophies. This is the responsibility of the Hunting Outfitter. All trophies are recorded on a TSA Collection Register, of which the Hunting Outfitter receives a copy after it has been signed by the responsible person. On return to our office, all data is captured on our system and a copy of the Collection Register is sent to the client. The client needs to confirm that all different species and trophy parts were collected. Processing of trophies will only commence once confirmation is received from the client. A TOPS Hunting Permit, if applicable, signed by the client. Please check under “General Info” / “TOPS” for the list of TOPS Species. Should any original hunting permit / document not be signed by the respective hunting client, our government WILL NOT issue an Export Permit. The original hunting permit is seen by our issuing authority as the only legal document. Copies, scanned and emailed documents will not be acceptable to them. 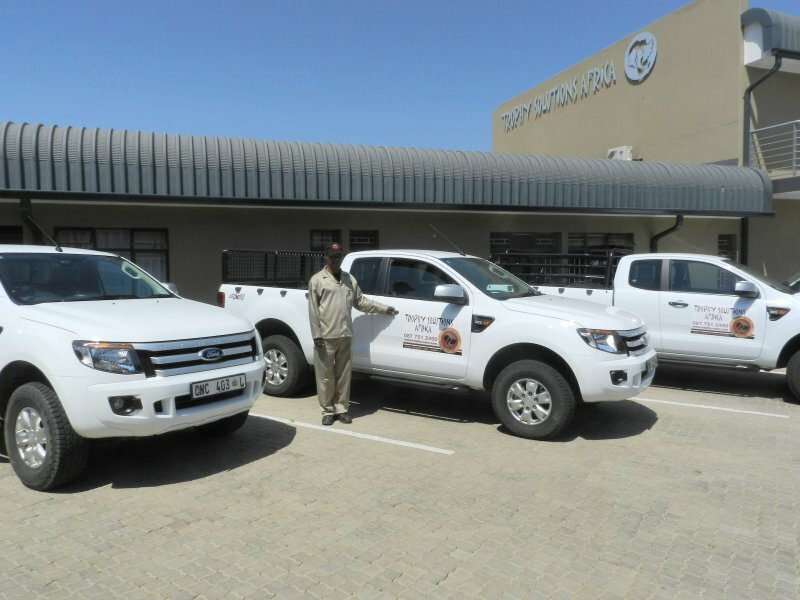 Once all trophies are checked, they are carefully loaded on our vehicle and closed with purpose made tarpaulins for safe transportation to our processing facility..
Trophy Solutions Africa (TSA) is in operation since early 2003 and is owned by Johan and Estie van der Merwe. We run our business from Polokwane, previously known as Pietersburg, capitol of Limpopo Province. We dedicate all our time, attention and energy to our business. As the hunting season does not have weeks or weekends, we are available seven days a week, during the hunting season!